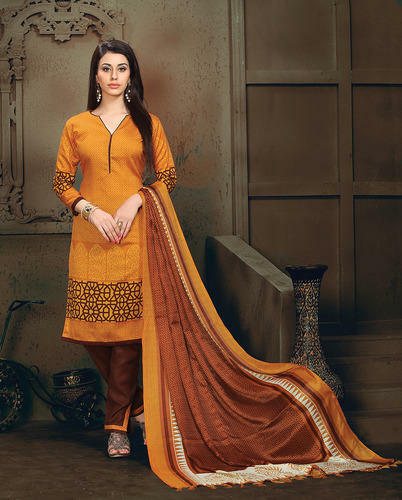 This lovely suit has orange color abstract print weaving on all over the top and brown colored abstract print on borderline & sleeves with brown colored piping at the neckline which gives a rich look. The orange colored top is fabricated in Bangalore silk, while the bottom is made of cotton fabric. The heavy bhagalpuri dupatta. Get this amazing suit now. “Viva N Diva Couture”, is a well-known entity established in the year 2011, at Surat (Gujarat, India) and is engaged in manufacturing, exporting and supplying high quality range of Bhagalpuri Sarees, Designer Salwar Suits, Printed Sarees, Indian Wedding Sarees, Pakistani Salwar Suits, Anarkali Salwar Suits, etc. These products are designed and manufactured using the finest quality soft fabrics and advanced stitching techniques under the supervision of our skilled professionals as per the latest fashion trend. Our range of Sarees includes Bhagalpuri Sarees, Printed Sarees, Designer Sarees, Bhgalpuri Sarees, Bhagalpuri Saree, Embroidery Designer Kurti, Anarkali Salwar Suit, Bhagalpuri Sarees, Crepe Sarees, Printed Crepe Sarees, Bhagalpuri Printed Sarees. Also, the offered products are extremely valued by the esteemed clients for their exquisite design, appealing looks, high comfort level, colorfastness and perfect fitting. Apart from this, the offered products are available in various sizes, colors, designs and patterns as per the varied requirements of clients at affordable prices.